His first name was Johannes. We always called him Opa—the Dutch word for “grandfather.” He’d been in my life since I was born, but I hadn’t even known his real name. People who weren’t Dutch, like my mom, called him John. Most everyone else called him Jan. But his legal documents said Johannes, a name I’d never heard in my life, until I started this. Opa and my grandmother, Oma, lived in a European-style house in Niagara Falls, Canada. In my memories, the house smells like warm breakfast and sounds like laughing relatives. But that place was 1,400 miles from where I grew up, and the years evaporated. Before I knew it, my grandparents were gone. When I began researching my genealogy, I hoped to find out more about where, and who, they came from. Sifting through old records won’t bring back lost years, but I thought it might be a way to learn some of the stories they never had a chance to tell me. So when I searched “Jan Nieuwesteeg” in the “All Collections” bar on Ancestry.com, I expected to uncover a trove of information about a man I’d hardly known. That didn’t happen. The search engine returned an avalanche of results, but the only thing I could find that related to my grandfather was the street address of that charming, noisy house. Annoyed, I typed “Holland” for Opa’s birth location and “Ontario, Canada” as the place he’d died. The search engine rewarded me with 2,452 results. Most of the records were in Dutch. Usually, people here in the U.S. have never seen my last name before (much less know how to pronounce it), but it turns out that Nieuwesteeg is pretty common in the Netherlands. I clicked and scrolled. Frustrated, I wondered how I’d be able to fill in an entire family tree if I couldn’t even pinpoint my own grandfather. So I decided to try my grandmother, Oma. I had her birth date from a little card that I’d kept after her funeral. I entered “Henrica Nieuwesteeg” into the search bar. It took a little scrolling, and a little more frustration, but eventually I found something. When I clicked the link, up popped a scanned copy of a marked-over passenger list for a ship called the Maasdam. According to this list, the Maasdam had left Rotterdam, South Holland, in June 1953, with three Nieuwesteegs aboard: Johannes, Henrica and Hendrieus. I knew my grandparents moved from the Netherlands several years after World War II. I knew that they’d left the tidy streets and long canals and familiar close-set houses for the chance to start fresh, to shake off the memories of Nazi occupation. I’d almost bypassed the record, because the only name I recognized was Henrica’s. But as I sat mulling it over, I realized that Hendrieus must be my dad’s oldest brother, my uncle Hein. And then it dawned on me that Jan—the name that wound up on my grandfather’s gravestone—was just a nickname, a shorter version of Johannes. According to the passenger list, Oma, Opa and my young uncle had five bags with them. I tried to imagine what that boat ride must have been like, packing all of a family’s worldly possessions into five bags and setting off for a continent they’d never seen. I wondered how nervous and excited they must have felt. I thought about all that had transpired in my grandparents’ lives between their ride on the Maasdam and the final years they spent in the familiar house that smelled like breakfast. My heart was thumping in my chest as I read over the old, scanned passenger list. I was pleased with myself. I felt like a detective who’d just uncovered an interesting clue. As I stared at the old document, though, my excitement soon turned to sadness. I realized that, for a moment, an old file on a computer screen made me feel closer to my grandparents than I’d ever felt when they were alive. For the past eight years, I’ve really enjoyed keeping a garden. I like planting seeds and taking care of the little seedlings that sprout. It’s exciting to watch visuals of my labor and attention manifest into something beautiful. I like the connection I feel to the earth when I put my hands in the soil, and the lessons that plants teach. They’re forgiving; they adapt. They’re pure in their simplicity. The idea of genealogy—or at least, the business it’s become—always struck me as self-indulgent. In 2014 Time called genealogy a billion-dollar industry as well as the second-most common hobby in America, after gardening. I wondered how that could be. 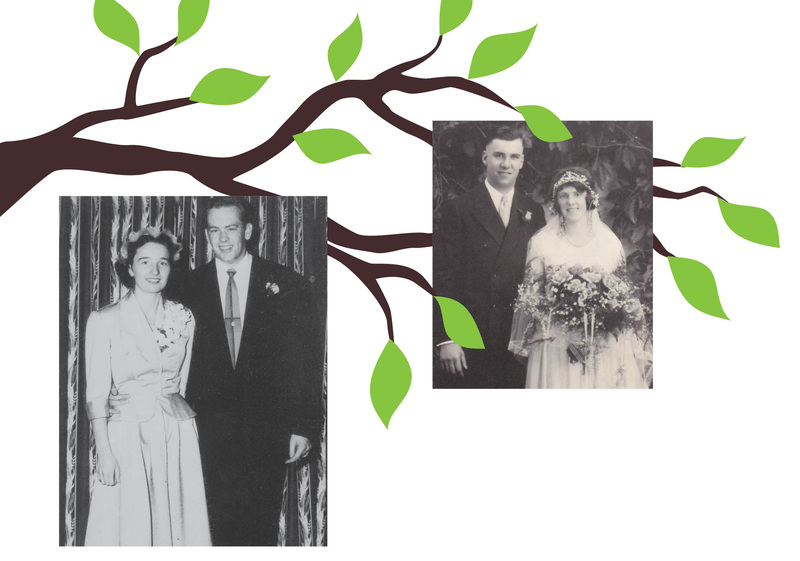 Genealogy as a pastime seemed like the total opposite of gardening, like just another manifestation of a self-obsessed culture that spends hours each day tending to social media vanity pages. I figured looking up ancestors was a conversation piece for most people, an additional way to grab attention. I already knew plenty about my parents, and therefore, plenty about myself. Just after I was born, my parents moved as far from their families as they could manage, leaving chilly Ontario for sunny South Florida as a young couple in their 20s. They never looked back. Throughout the years, we returned—on very rare occasions—to my parents’ hometowns. My brothers and I clung together around cousins we barely recognized. We’d always been independent, disconnected, and proud of it. I didn’t feel much need to uncover any long-lost relatives or dig up certain records. I was a little curious about my father’s parents, and my mom had expressed vague interest in learning about her Scottish ancestors. But beyond that, I wasn’t sure if the names and birth dates of a bunch of long-dead strangers could add any value to my life. And worse yet, I was afraid I would discover something terrible. See, I’ve always known that my father’s side of the family is almost all Dutch. And although the Netherlands has, historically, produced some of the world’s greatest artists and thinkers and explorers, it also produced a lot of people who were notoriously involved in the international slave trade. So going in, I was hesitant. I really, really did not want to discover that someone in my family had profited from the sale of human beings. 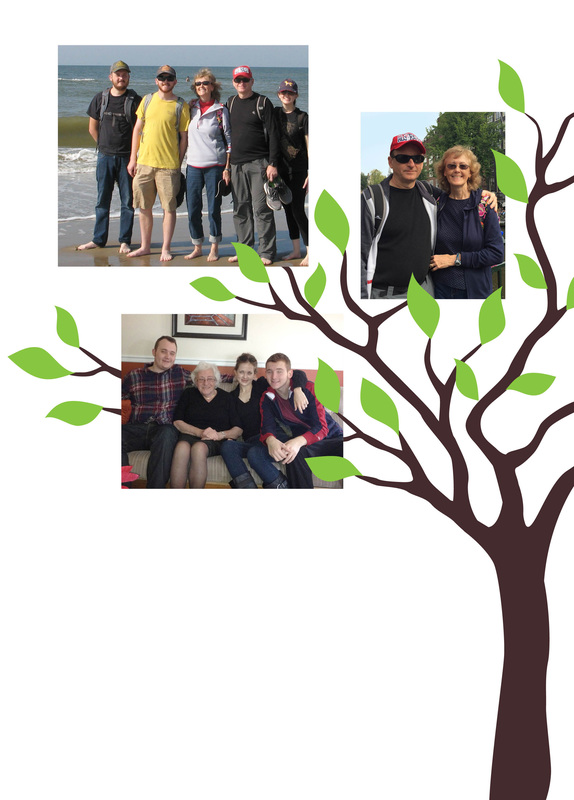 I started as simply and cautiously as possible: I put my name as the crux of the Family Tree tab on Ancestry.com, flanked by my parents, with their parents above them—all of us in neat rows of alternating blue and pink boxes. I texted my mom for the names and birth dates of her grandparents, and she sent back notes she’d found scratched in an old family Bible. After I filled in everything I could, I began cross-referencing records with birth dates, death dates, and the sparse details I knew about my farthest-back relations. I went from being skeptical to nearly obsessive in the span of a day. Search results returned information I’d never seen, and I eagerly snapped it all up. 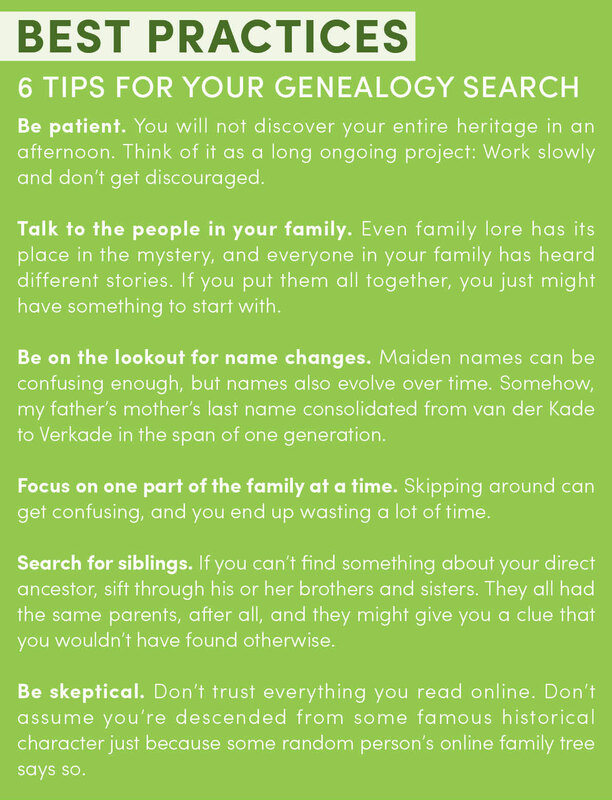 Each time I discovered a detail that helped me clarify a relative’s identity, whether it was learning someone’s mother’s maiden name or finding a birth certificate, I felt a little rush, like I’d just fitted another piece into a complicated puzzle. As I worked through the tree, I was excited to find so many people with my last name, and so many people with last names I recognized and knew to be part of me. As I filled in name after name and scraped together glimpses of long-lost identities, I turned over a question in my mind: What am I looking for? Some people begin ancestry searches because they think they’re descended from royalty. Some people do it because they’re looking for someone. Commercials for various sites feature testimonials from people who discovered they had ancestors in places they never imagined. Families who’d always thought they were one ethnicity learned they were actually something else entirely. After a while, you hope you might secretly be something nobody would suspect, too. You hope for a surprise twist in your own story, like you might read in a suspenseful novel. But when I took the DNA test—sending a vial of saliva through the mail—the results revealed that I was 100 percent European. I was actually a little disappointed. I thought, My ancestors needed to get out more. The more I searched, though, the more I realized that I liked the feeling that came every time I found someone I hadn’t known, or put something together to clarify an existence. In fact, this connected feeling started pushing me. When I found a photo of Oma’s father (my great-grandfather), a kind-looking man with prominent cheek-to-chin face lines, I was stunned by how much he looked like my own father. I stared at the picture, surprised by the overwhelming connection I felt to a person who’d died before I was born—a person who looked a lot like my father and a little like me. I found myself wishing I could have met him. People feel disconnected from their own relatives for a lot of reasons. Families move for jobs. Our social circles grow apart. We have different political beliefs. Sometimes we go years without speaking to the people we love, and we start to think we don’t have much in common. But with a family tree, you’re given a visualization of the things you share. More than science can even describe. I’m not particularly close to much of my extended family for all of those reasons, and some others, but I knew they’d all know more about our family history than any website. So I started reaching out. My maternal grandparents canceled their internet services a while back, so I wrote them a handwritten letter that closed with a question: What can you tell me about your parents and grandparents? I got a phone call one Saturday morning. I was surprised to hear my mom’s father on the other end of the line. He’d received my letter and was calling to tell me about his family. I emailed my dad’s sister, my aunt Mara, who’d recently visited relatives in the Netherlands. I Facebook-messaged a cousin on my mom’s side, because I’d heard that someone in her family had done genealogical research recently. 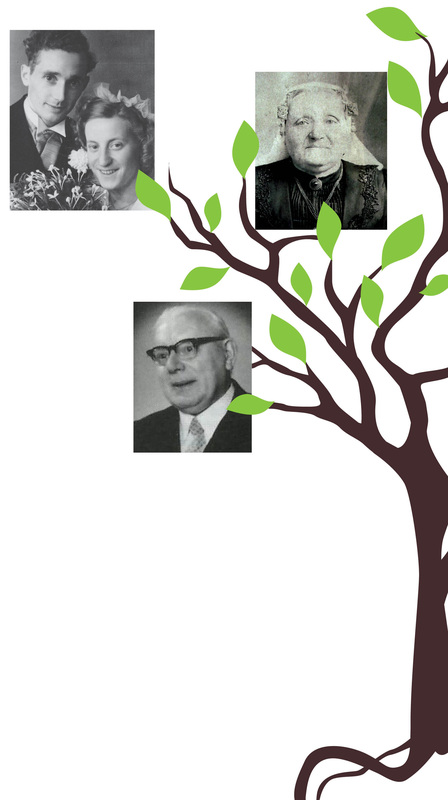 Through MyHeritage.com, I typed a note to Jan Verkade, a relative on Oma’s side who’d spent the last few years constructing an impressive family tree. Fortunately for me, Jan is the nicest pen pal ever, and forever eager to share his research. He was able to explain some of the French who dotted our family tree. The people born in Tourcoing in the 1600s were Huguenots, he told me. They fled and settled in the then-Dutch Republic to escape religious persecution sanctioned by King Louis XIV. I Googled the Huguenots who were essentially a sect of long-suffering Calvinist Protestants, and spent more than an hour reading about them. Curious what else was out there, I clicked around on CyndisList.com, FindMyPast.com, and ScotlandsPeople.gov.uk. I found images of my maternal great-grandparents’ gravestones on FindAGrave.com. I used Google Translate to interpret documents I found on WieWasWie.nl, a Dutch site brimming with records. Realizing that online ancestry sites were for amateurs, I installed a genealogy program that helped corral my unwieldy family trees into one space. The result was an overwhelmingly long list of names that seemed to spiral out of control. Without any stories to frame all these names, it was hard to make sense of any of it. Jan Verkade’s tree had dates as far back as the 1100s. As I climbed its branches, I picked names at random and researched them, trying to find factoids about people’s lives. I was delighted to learn I had plenty of bollen kwekers (according to Google Translate, “bulb growers”) in my family—other gardeners! I found a current picture of the house that my well-to-do great-great-great-grandparents had lived in. 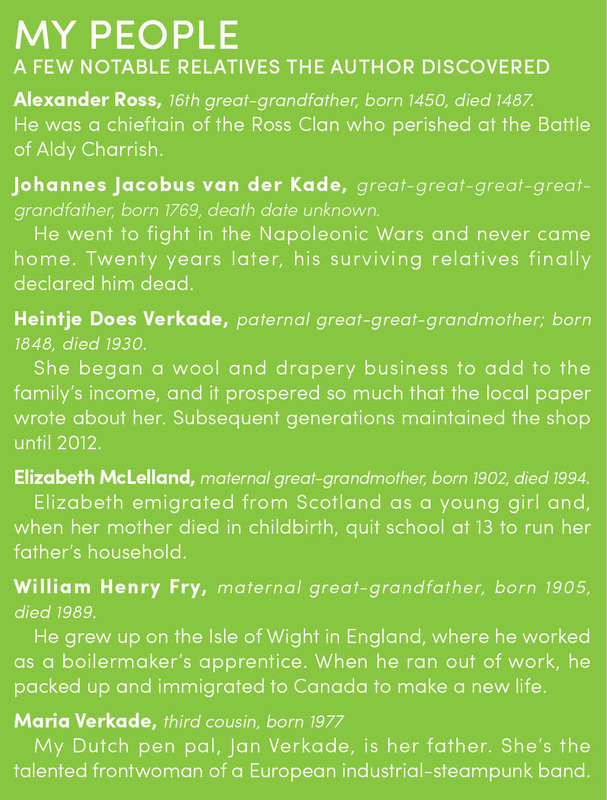 And I stumbled upon something of a family mystery while researching a relative named Johannes Jacobus van der Kade, born in 1769. I translated the note written below his death date. Apparently Johannes Jacobus had disappeared while fighting Napoleon Bonaparte’s army, or, as the note stated: “died in the service of the Emperor of Austria.” But there was a question mark beside his death date, listed as 1813. I tried to translate the note with Google, but all I got was something about a “20-year absence.” A missing person, from two centuries ago—and not just any person, but my own direct ancestor. I wondered what he’d gone through and how he’d disappeared. Within a few weeks, my quest to fill in my family tree was far more interesting than anything on Netflix. If I was having a glass of wine with my fiancé in the evening, I was probably scrolling through genealogy records on my laptop, too. At some points I had more browser tabs open than my computer could handle. These characters seemed so charming and different. I could see the dramatic moments of their lives playing out like scenes in a period movie. Sometimes I felt sad that I never had the chance to know them, that they’d died decades or centuries before I ever existed. There were sweet moments I had searching, like the afternoon my mom pulled out a slim green folder of old black-and-white photos and family obituaries that she clipped from various newspapers. She scattered them all over the sunny kitchen table of my childhood home. She showed me a well-worn ring that had belonged to her English grandmother. 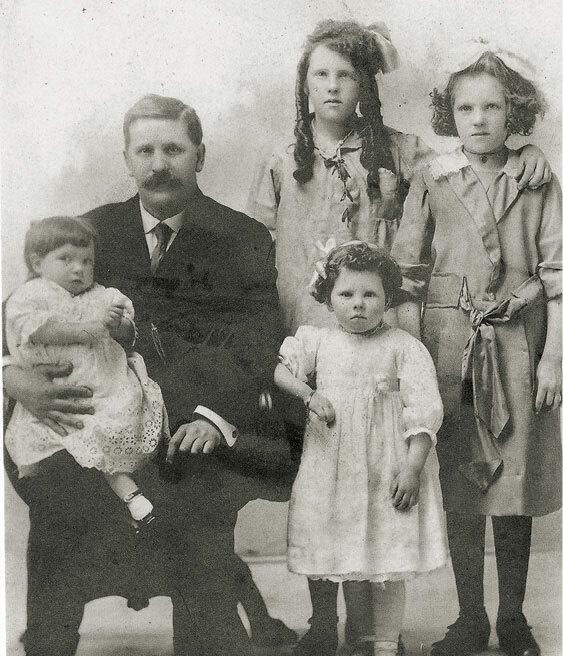 Her most compelling old photo featured a mustachioed, somber-eyed man surrounded by his four young daughters, all in stockings and dresses. My mom explained that the man was her great-grandfather, and that he’d just lost his wife in childbirth. “The saddest photo ever,” my mom remarked. As she pointed to faces that seemed somehow familiar and explained who these people were and what they’d done, we weren’t just mother and daughter. We were adjacent branches on a tree that was much bigger than both of us. There were also moments of great relief. Eventually I was able to trace both sides of my family back to the 1500s. I found farmers and shepherds and sheriffs. But one thing I didn’t find was a slaver. In fact, at least a few of my relatives fought for the oppressed, turning against the dictators and royalty of France. It’s hard to explain what it feels like to be relieved that your ancestors—at least to my knowledge—weren’t slave traders. But merely worrying is a solemn reminder that, for generations, people did own and trade other people like property. In some places, it still happens. Be warned: A genealogy search can get heavy in a hurry. But the search is rewarding and much more fun than I imagined. While perusing my mom’s ancestry, I found a link to Alexander, the 15th-century laird of Clan Ross. When I looked him up, I read that he’d been engaged in a vicious feud with Clan Mackay. When he caught some of his enemies raiding on his family lands, he locked them in a church and set it on fire. With the distance of a few hundred years, a brutal story makes for an interesting conversation piece. When you look at a family tree spanning generations, the most striking thing about it is all the death involved. Looking at rows upon rows of closed-loop lifespans is like standing in a cemetery filled with your kin. The living generations in my tree looked like a sliver-thin barrier holding back centuries of mortality, a haunting reminder of how short life is. For me, this meant making a conscious decision that I will work harder, do better, and leave more behind for the next generation. Learning about these people and their stories felt like discovering new things about myself. I was wrong about genealogy and gardening being different. The truth is, they have a lot in common. The longer I stuck with it, the more I saw how finding my long-lost ancestors connected me to something larger. The more I could see the fruits of my labor. The more it nourished a part of me I didn’t even realize needed nourishing. Learning about these people and their stories felt like discovering new things about myself. Like learning you love a food you’d never tasted before or a band you’d never heard. It’s inspiring and invigorating because it made me wonder what else I don’t know about myself. What else is out there? The more layers of family I uncovered, the more I thought back to the mysterious Johannes Jacobus van der Kade, my great-great-great-great-grandfather who’d gone missing during the Napoleonic Wars. I wrote to Jan Verkade again. He messaged back to tell me that, according to files he’d found in his late father’s possession, it seems that Johannes Jacobus had been gone for two decades before his surviving relatives officially declared him dead, the 20-year absence I’d wondered about. Most likely, Jan told me, our common ancestor died in either the Battle of Austerlitz in 1805 or during the 1812 French invasion of Russia. At the time, the former Kingdom of Holland had been subsumed into the First French Empire. As citizens of Napoleon’s empire, many Dutchmen fought in Napoleon Bonaparte’s army. But Johannes Jacobus apparently ran off to fight against the emperor. I pictured him turning back to wave to his wife, Catharina, and their five little children as they watched from the window of a narrow Dutch house. Jan Verkade had a guess that was quite different altogether: “It could just as well be that he never went to war but instead to southern France, meeting a pretty française and having seven children with her,” Jan speculated in an email. It’s strange to think that Johannes Jacobus could be listed in somebody else’s family tree, under an entirely different name. It’s stranger still to imagine my own family members as part of the stories I’d read about in history class. My searches had tethered me to history in a way that I’d never felt before. Researching my genealogy was sort of like reading a history book. Everything that happened to my ancestors was reflective of the times they lived in. Some of my mom’s Scottish ancestors popped up in North America around the time England began its campaign to dissolve Highland culture. I’d learned about the Napoleonic Wars, the Huguenots, and even gleaned a sense of what it was like in Nazi-occupied Holland. I’d found out that the castle owned by an upper-class family strain had probably exploded when a ship carrying gunpowder crashed in Leiden, destroying hundreds of homes and lives. My searches had tethered me to history in a way that I’d never felt before. It wasn’t just stuff happening to old dead people; it was stuff happening to my old dead people. The puzzle I’d been putting together had gone from something abstract to something so intensely personal that I felt reluctant to write about it. I’d always thought of myself as just the daughter of Leo and Cheryl Nieuwesteeg. And here I was, suddenly thinking of myself as the product of Johannes Jacobus and Scottish clansmen and English farmwives and Dutch nobility, shopkeepers and bollen kwekers. And, of course, two immigrants who left their war-scarred country to make a better life for their children in Niagara Falls, Canada. And I’m proud. That’s not a word I use often, but I’m proud of them all. I’m proud of the challenges they endured, the choices they faced, the history they lived. I’m also making an effort to stay in better contact with my living family: the aunts and uncles I know mostly through stories from my parents, the cousins I barely see, the grandparents I’m lucky enough to still have in my life. I’ve sent messages to second and third cousins I would have otherwise never had a reason to contact. Relatives are important, no matter how distant they seem, and funerals shouldn’t be the only time we reunite. I have a close relationship with my parents: My dad and I go for weekly runs at a local park, and my mom and I frequent art museums. I also know that I need to nurture my relationship with my brothers, the only two other people with my exact same ancestral heritage. I know that I’ll have to work to ensure that we always stay close, even as we get older and have less in common. I want to ensure that we can always rely on each other, always cling together the way we did when we were uncomfortable around extended family we didn’t know very well. I know families can’t always be like the Scottish folks who came over generations ago as a clan, all bound together no matter the circumstance. But there is a strength in numbers, and now that I’ve mapped our family tree, the more I can see all of the things we have in common. Oma and Opa are gone, and their breakfast-scented house belongs to another family. But they’re part of me, and they’re part of many other living people, too. The strangers that I’d set out to find were more than just pieces in a puzzle, I realized. They were pieces of my own self. Of course there will always be gaps in the tree, question marks in place of dates, missing relatives and ancestors lost along the way. Neither Jan nor I will probably ever know for sure what happened to Johannes Jacobus. But it doesn’t matter too much. He lives on, just like Opa and Oma. Just like all of the others. They’re part of my parents, part of my brothers, and part of me. And eventually, time will tick away, and the list of people in my family tree will grow even longer. It makes me ponder how people will live hundreds of years from now and what life will look like then. And when the generations of the future look back on all of us, I wonder what they’ll discover.